There's this cookie that I'm always craving. 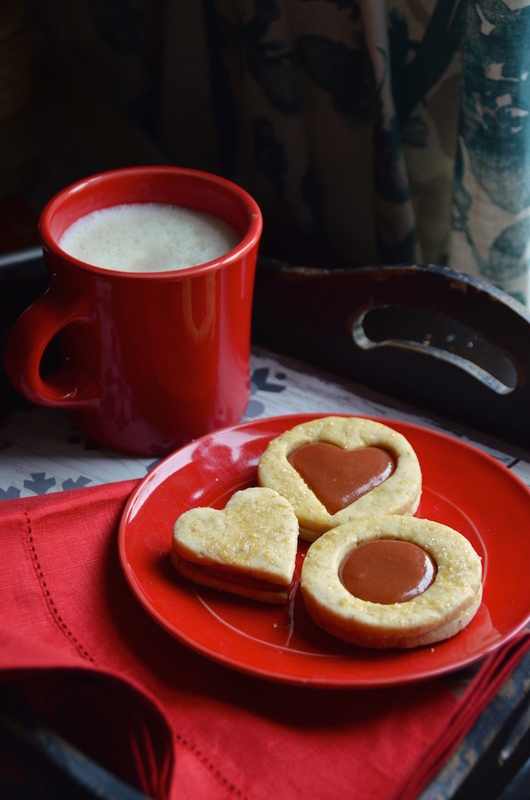 It's a giant heart-shaped Linzer cookie filled with raspberry jam and topped with big, sparkly sugar crystals. There are a lot of cookies that look like it, but the one that I want--the VERY SPECIFIC one that I want--is unfortunately, not available in NYC. I used to buy this cookie in packages of 3 at a cafe in Georgetown back during my college years living in Washington, DC. They were my favorite Valentine's Day treat, and I think about them every year around this time. I haven't been back to DC in ages, but whenever I think about planning a trip, those cookies are right at the top of my list of reasons why I want to visit. With those cookies in mind, I decided to bake my own version at home. Now these are NOT like the ones from the restaurant. They're nothing like them, actually. (Sorry to tease you.) I haven't quite figured out that magic formula yet. 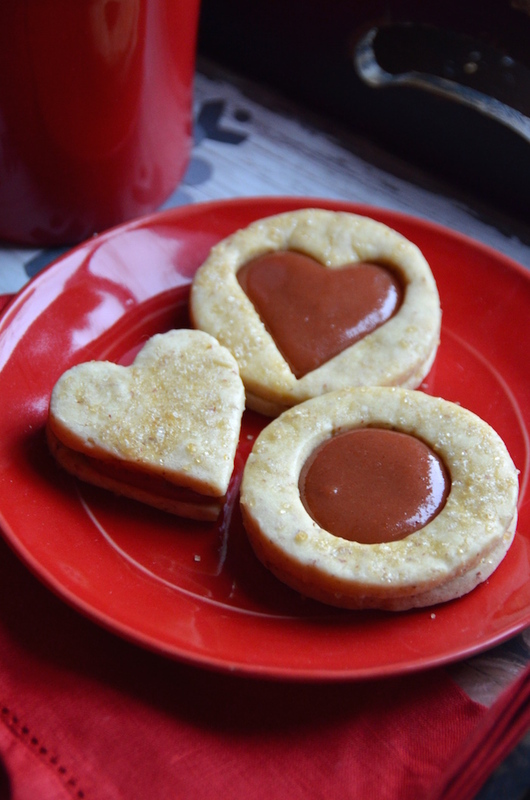 Instead, I went totally different with the flavors, here, but kept the heart shape and sugar sprinkle. The results are very lovely and they disappeared quickly when I served them to some neighbors at a party. Linzer cookies are very simple, not-too-sweet shortbread cookies made with ground nuts (usually hazelnuts or almonds--I used almonds) that are then filled with jam. The top part of the cookie sandwich is cut out to make a little jam window (at least that's what I call it because doesn't that sound adorable?). I used guava paste to fill my cookies. Guava paste is a totally Latin thing that you can find in the Latin (usually Goya) part of your grocery store. If you don't have a Latin part of your grocery store, you can get it on Amazon. These are fairly easy to make, but they do require a few steps. I recommend making the dough in advance and letting it chill overnight, then finishing them off the next day. Once made, they keep well for a couple weeks in an air-tight container. Yields about 2 dozen cookies. Adapted from Epicurious. Combine the butter and remaining sugar in the base of an electric mixer and beat for 5 minutes, or until fluffy. Add the egg, vanilla, and almond, and continue to beat for another 3 minutes. Whisk together flour, baking powder, and salt, and add to the butter mixture along with the nuts. Mix well until evenly combined. Remove from mixer and divide dough evenly into two round discs. Wrap with plastic wrap and place in refrigerator to chill for at least 2 hours. When ready to bake, preheat oven to 350 degrees. Line two baking sheets with parchment paper. Working with one dough disc at a time, sprinkle flour on a work surface and roll out to 1/8” inch thick round. 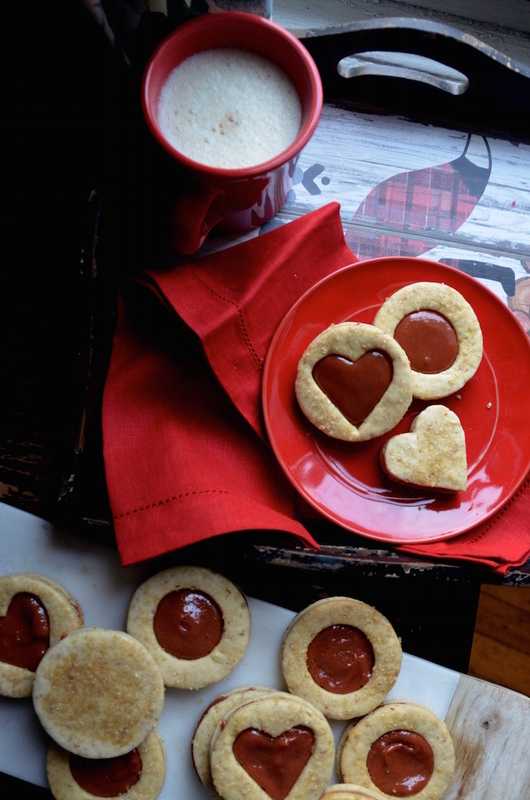 Cut out cookies with round cookie cutter and placed on prepared baking sheets, then use a smaller heart or round cookie cutter to cut out the centers of half the cookies. Repeat with other half of dough. Reroll and chill any remaining dough and repeat again until all dough is used up. 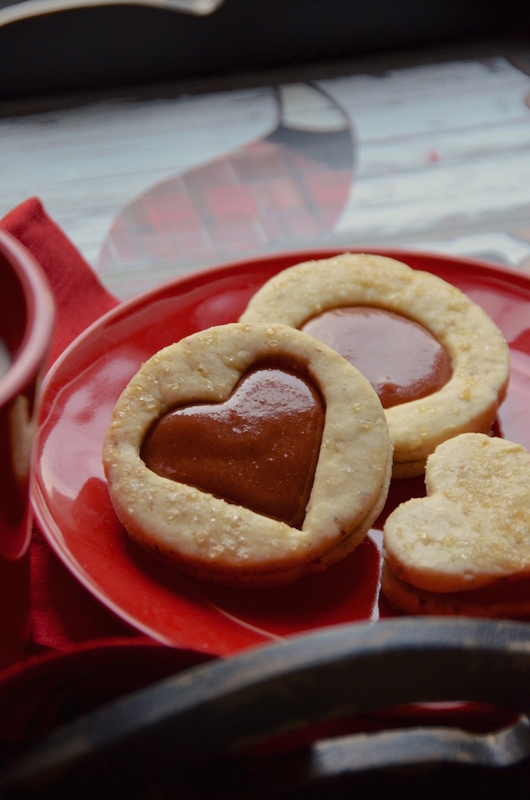 Sprinkle cut-out cookie tops with raw sugar and press in slightly (optional). Bake cookies 10-15 minutes, or until just very slightly golden around the edges. To make sandwiches, heat guava paste in a microwave for 30 seconds at a time until smooth. Add dollops to the center of the whole cookies, then sandwich with the cut-out tops. If guava hardens, heat in microwave again for another 15-20 seconds to make it soft. Repeat until all the cookies are filled.